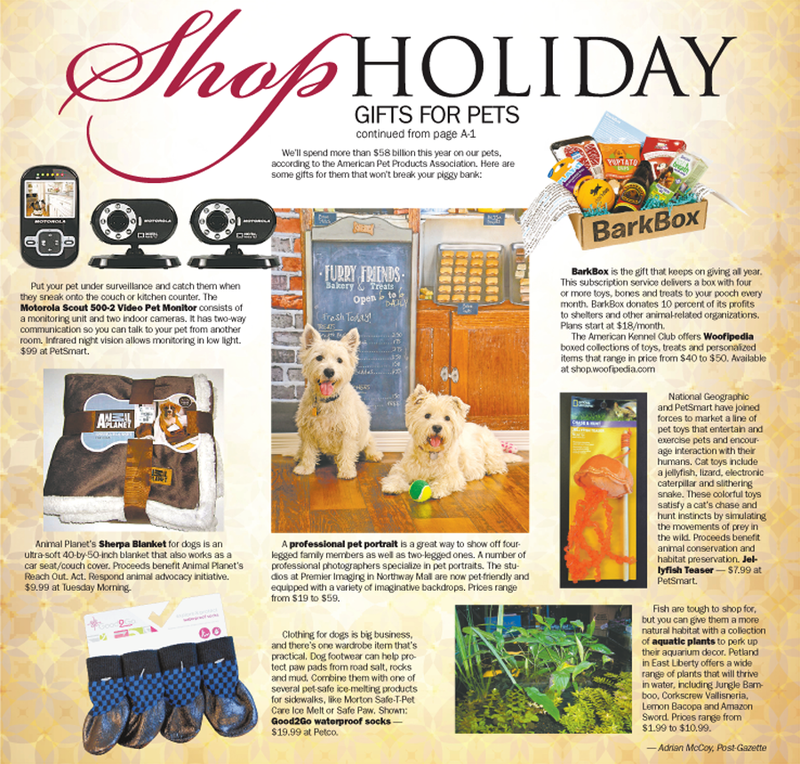 Do not forget your pets during the holiday gift giving! Some ideas for pet gifts. National Geographic and PetSmart have joined forces to market a line of pet toys that entertain and exercise pets and encourage interaction with their humans. Cat toys include a jellyfish, lizard, electronic caterpillar and slithering snake. These colorful toys satisfy a cat’s chase and hunt instincts by simulating the movements of prey in the wild. Proceeds benefit animal conservation and habitat preservation. Jellyfish Teaser — $7.99 at PetSmart. Clothing for dogs is big business, and there’s one wardrobe item that’s practical. Dog footwear can help protect paw pads from road salt, rocks and mud. Combine them with one of several pet-safe ice-melting products for sidewalks, like Morton Safe-T-Pet Care Ice Melt or Safe Paw. Shown: Good2Go waterproof socks ­— $19.99 at Petco. Fish are tough to shop for, but you can give them a more natural habitat with a collection of aquatic plants to perk up their aquarium decor. Petland in East Liberty offers a wide range of plants that will thrive in water, including Jungle Bamboo, Corkscrew Vallisneria, Lemon Bacopa and Amazon Sword. Prices range from $1.99 to $10.99. A professional pet portrait is a great way to show off four-legged family members as well as two-legged ones. A number of professional photographers specialize in pet portraits. The studios at Premier Imaging in Northway Mall are now pet-friendly and equipped with a variety of imaginative backdrops. Prices range from $19 to $59. Put your pet under surveillance and catch them when they sneak onto the couch or kitchen counter. The Motorola Scout 500-2 Video Pet Monitor consists of a monitoring unit and two indoor cameras. It has two-way communication so you can talk to your pet from another room. Infrared night vision allows monitoring in low light. $99 at PetSmart. BarkBox is the gift that keeps on giving all year. This subscription service delivers a box with four or more toys, bones and treats to your pooch every month. BarkBox donates 10 percent of its profits to shelters and other animal-related organizations. Plans start at $18/month. Animal Planet’s Sherpa Blanket for dogs is an ultra-soft 40-by-50-inch blanket that also works as a car seat/couch cover. Proceeds benefit Animal Planet’s Reach Out. Act. Respond animal advocacy initiative. $9.99 at Tuesday Morning.